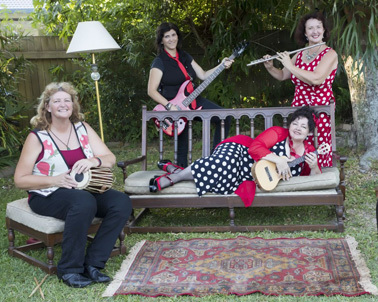 Mama Juju & The Jam Tarts is a Brisbane-based, four-piece multi-instrumental, all-singing, all-women band playing tenor and barritone ukuleles, bass, flute, harmonica, drums and various percussion. A Mama Juju & The Jam Tarts concert is like a box of chocolates — you never quite know what you are going to get next — folk, blues, jazz, pop and more. Julie Minto, Vicky Macdonald, Trish Rodwell, Connie Di Dato always create a fun, upbeat vibe with quirky songs, big personalities and sweet harmonies. The Jam Tarts slide easily across the genres from folk to jazz, rock to blues and back again swapping instruments and vocal harmonies as they go. The group mostly plays their own quirky original songs, but can also draw on a huge repertoire of covers. During the set, the band will involve the audience by singing call and response type songs, and showing them how to play at least two songs with an invite to join the ladies in a jam.